A key to figuring out how to defeat cancer is understanding how it behaves at the cellular level. Winship researchers use high resolution microscopy to peer into cellular worlds and illuminate the beautiful, yet deadly, structures within. 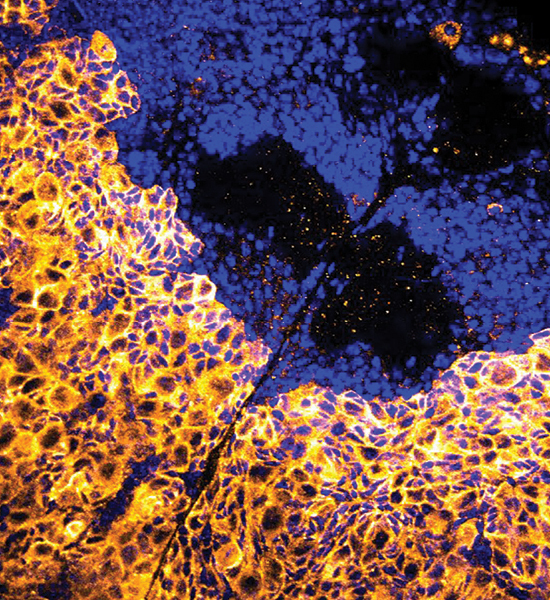 Emily Summerbell from Winship investigator Adam Marcus's lab created images of the inner skeleton of lung cancer cells to study how these structures change within groups of invasive cancer cells. The cell skeleton (made of a protein called tubulin) is orange. The nucleus of the cell is blue. 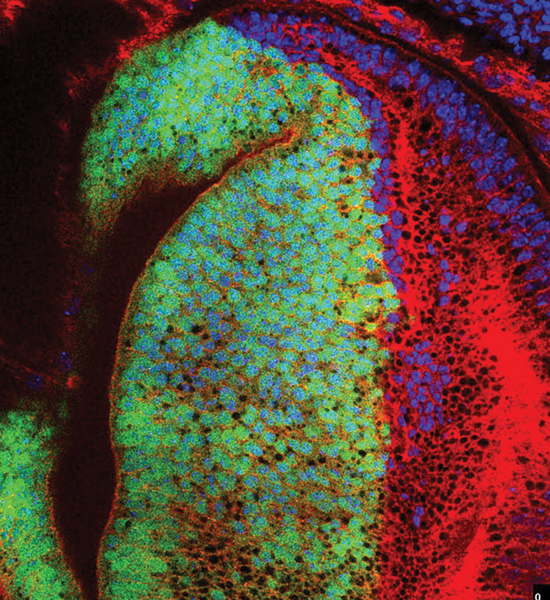 Subhas Mukherjee in Winship pathologist Dan Brat's lab uses a fly brain to show a tumor (orange) growing into the normal brain tissue (blue). Mukherjee studies the behavior of brain tumor stem cells to learn how targeted therapies could help. 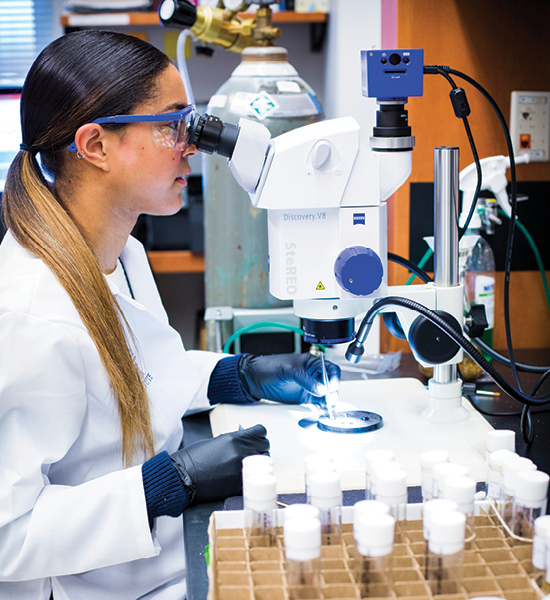 Working in the lab of Melissa Gilbert-Ross, director of the Winship Cancer Animal Models Shared Resource, graduate student Briana Brown dissects a fruit fly to isolate its wing. She then stains and magnifies the wing to create the image below. Briana Brown magnified the wing of a fly 63 times in order to mimic a form of lung cancer mutation. She's trying to understand how the mutation works to promote metastasis or the spread of these tumors. Satoru Osuka working in the lab of Erwin Van Meir, Winship neuro-oncology investigator, uses brain tumor cells from a mouse to study the recurrence of glioblastoma multiforme. 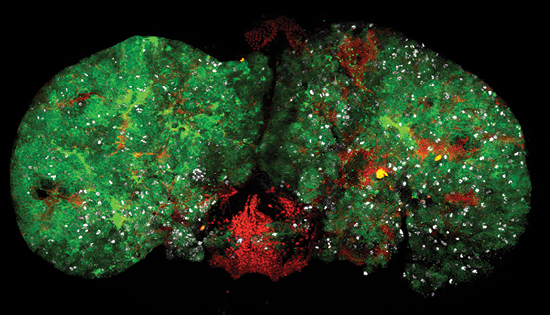 This image represents an over-expressed protein (in green) that could be key in the progression of the disease. The cell body is red and the nucleus is purplish blue. "High-resolution live-cell imaging allows us to see at a microscopic level how cells behave and even how individual molecules function. Ultimately it's this biology that is driving the tumor." Alex Chen from Winship brain tumor researcher Renee Read's lab uses fruit flies to understand glioblastoma multiforme, a malignant and incurable brain tumor. 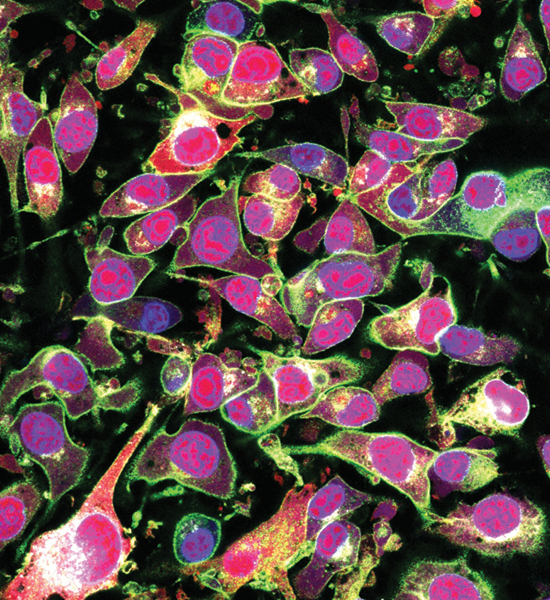 This image depicts the effects of knocking down or reducing the amount of protein that may be involved in tumor progression. 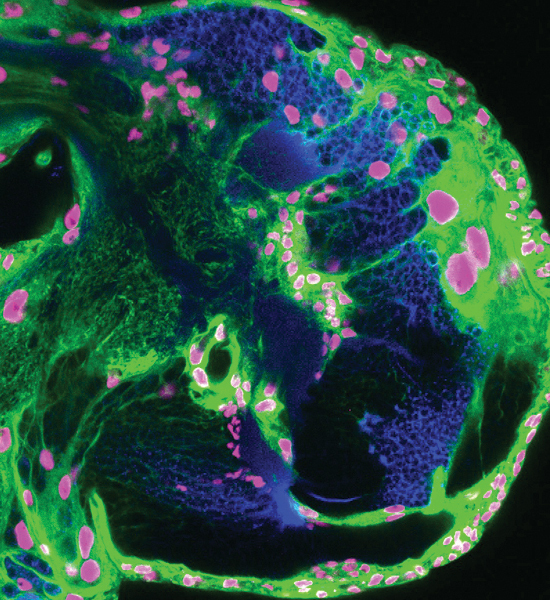 Subhas Mukherjee enlarged the tumor in a fly brain 20 times to depict the tumor stem cells (in green) and abundant dividing cells (in white). The cell neurons are in red. 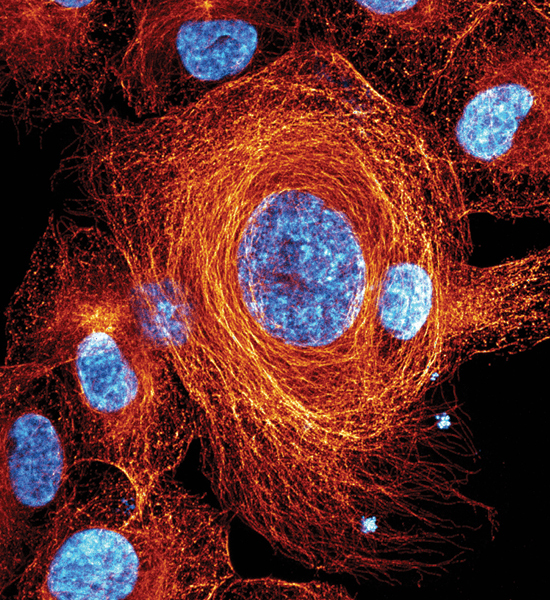 Emily Summerbell created what she calls a tubulin sunburst from the internal skeleton of a lung cancer cell. 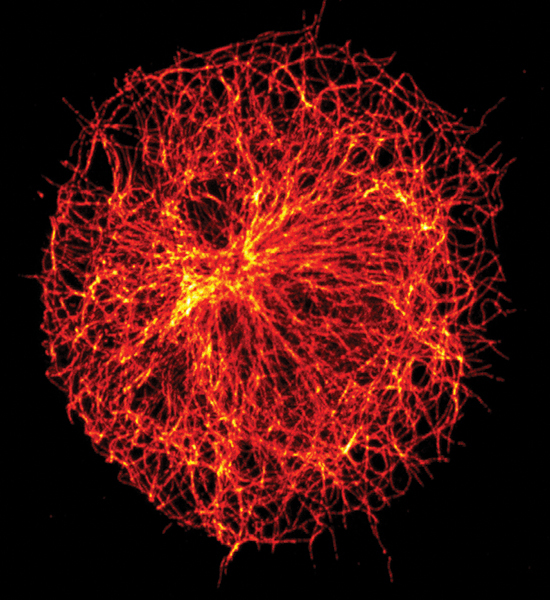 It is made of structures called microtubules. The pushing and pulling of the cell skeleton plays a critical role in how cancer cells move and multiply. 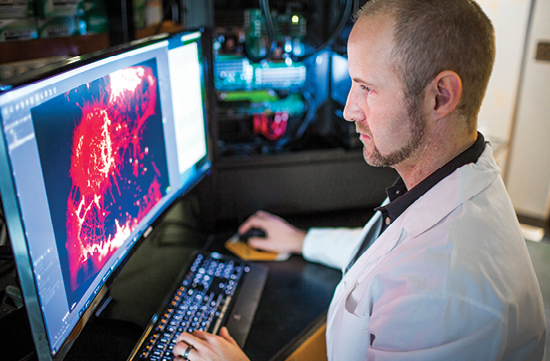 Neil Anthony, assistant scientist in the Integrated Cellular Imaging Shared Resource, views a cancer cell in the new lattice sheet microscope. The new technology enables researchers to view live cells at the highest combined 4D resolution attainable (three spatial dimensions plus time). Winship is one of only 15 sites worldwide to acquire and install a lattice sheet microscope. 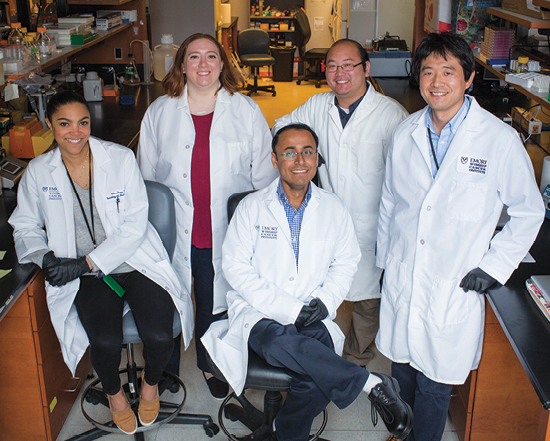 The Winship researchers who made these images are (left to right): Briana Brown, graduate student; Emily Summerbell, graduate student; Subhas Mukherjee, postdoctoral fellow; Alex Chen, graduate student; Satoru Osuka, postdoctoral fellow.